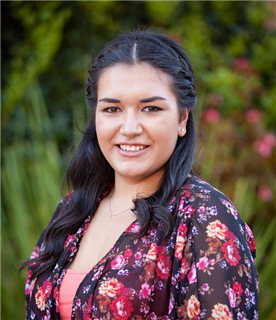 Jennifer, currently a freshman at Whittier College, wrote the play as part of a Playwrights Project program in Pacific Ridge's Advanced Theater class. "Fronteras Hechas del Dinero" tells the story of a 16-year-old Mexican-American girl struggling to reconcile her desire to pursue an education with her responsibilities to family. It was one of just four plays, out of 269 submissions, selected to receive a full, professional production. Pacific Ridge theater teacher Fredreka Irvine and a group of theater students attended the Monday matinee performance and were left impressed by Jennifer's work . "The writing was unique, the acting was authentic, and the story was captivating," Ms. Irvine said. "It was an honor to be able to see such a great production from a Pacific Ridge graduate."